In 2012, 19 projects were selected to receive grants based on their ability to provide a valley-wide benefit in water conservation and/ or water quality improvement. A total of $300,000 was awarded to help fund more than $1 million dollars’ worth of water-related projects. These grants promote best practices and knowledge sharing and ranged in value from $2,000 to the Bishop Wild Bird Sanctuary, to $27,500 to the District of Peachland. This project received grant funds to study and evaluate the state of riparian habitats along this key fish-bearing stream. The study helped identify conservation strategies and best management practices. Identifying and addressing vulnerabilities along Mill Creek will inform future habitat restoration and run-off mitigation initiatives in Kelowna and basin-wide. Okanagan Science Centre – Water, Water (Every) Where? This educational project had multiple facets including a one-day water conservation and protection summer camp for kids. It also included a school and homeschool program that taught about contamination, treatment and preservation of our water sources. The project was ongoing into the new fiscal year with the display of the world-class exhibit “WaterWorks.” This interactive exhibit teaches about water use, treatment, conservation, the natural water cycle and more. The exhibit will remain on display at OSC until January 2013 with the “Household Water Cycle” display on permanent exhibit. The Okanagan Nation Alliance’s Okanagan River Water Intake Feasibility Study gathered data and estimated retrofitting costs on irrigation intakes along Okanagan River. Because fish habitat is defined by a flat layer of water which must be the correct temperature and have ample oxygen, year to year weather variations and water availability will directly impact the depth and size of this water layer. Research initiatives of this kind will provide Okanagan communities with a diverse body of knowledge essential for protecting fish habitat and balancing irrigation demands. This wild bird sanctuary and natural garden is open to the public year-round. 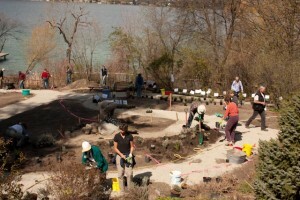 The project included converting a large area of turf into water-conserving native plants, signage, and workshops to demonstrate the effects of this type of landscape. Public outreach and education initiatives by the Bishop Wild Bird Foundation will promote the habitat benefits of native plants for wildlife throughout the Okanagan. Steele Springs Waterworks District will use wireless radio communication between reservoir and pumphouse to eliminate overflow of the reservoir. This will keep more water in the ecosystem, as water will follow its course from the springs to Deep Creek, and into Okanagan Lake, rather than diverted to a reservoir. The project fits well with the OBWB’s recent work with tracking and reporting reservoir levels in the BCWURC (BC Water Use Reporting Centre) project. The City of Armstrong is installing residential water meters. Commercial users have been metered for several years and the new residential meters will use the same software and technology. A consumption based rate structure has been developed. This project both addresses residential water conservation and completion of valley wide efforts as most communities are now metered. The project will create two vegetated swale pathways as a demonstration of techniques that can filter and slow water run-off, decrease erosion and increase absorption on the landscape. The increased water retention on site will decrease the water needs of the garden. This project highlights the “Slow It, Spread It, Sink It!” guidebook and develops a community resource that focuses on sustainable agriculture. Restoration works will be completed on Coldstream Creek: reinforced cattle crossing structure, increased fencing and riparian restoration. Coldstream Creek is the largest tributary to Kalamalka Lake and highly affected by agriculture and urban activities; this is a priority area for restoration works, with significant water quality improvements. An irrigation auditing program focused on high water use residential customers. This project will also develop educational resources on landscape planning, irrigation timer setting, sprinkler troubleshooting and others. This project promotes best practices in outdoor water conservation, one of the Okanagan’s highest water uses. OBWB staff will ask that templates of education resources be made available to WaterWise and other local governments. A workshop will be hosted where participants will construct a rain barrel. The construction information will be shared among valley. The most valuable portion of this project will be creating and sharing the rain barrel construction information. Funding will be contingent on RDNO providing a resource (step-by-step picture brochure or “how to” video) for rain barrel construction. The focus of this project is on zebra and quagga mussels and will determine presence/absence in Okanagan Lake (by sampling), most probable vectors of infestation and decontamination protocols to limit the impact on water suppliers in the Okanagan. It is predicted that the devastating zebra and quagga mussels will reach the Okanagan in the next 3 to 5 years. Strategies to limit impact on water suppliers (and other lake users) need to be developed now. Funding will be contingent on communication of results with senior government agencies and the Invasive Species Council, and outreach initiatives coordinated with Water Wise. OXA will continue to enhance its strong offerings in Xeriscape education and outreach, strengthening the message around Xeriscape and low water plant options for Okanagan residents. Funding will be directed to Xeriscape classes (to reach a broad audience), 2012 garden contest and to enhance the online plant database with listings of local nurseries supplying specific plants. This will allow residents to easily source the plants they want. RDCO will conduct leak detection on Westshore and Killiney Beach water systems so that volume of water supplied more closely matches volume of water consumed – currently the volume supplied is four times the consumption. This project supports water conservation goals, thus keeping more water in the Okanagan Lake system. OCCP will use FIM data to create an Aquatic Habitat Index (AHI) for Kalamalka and Wood Lake, adding to other AHI work across the valley. The index provides an easily understood visual ranking system (colour coded) of shoreline habitat for local government planning and development. Synthesizing the complex information from the Foreshore Inventory Mapping process means sensitive habitat information can be easily conveyed to a wide variety of audiences. This project adds to valley wide work on foreshore areas. This project will replace turf grass in residential (volunteer homeowners) and municipal settings with drought tolerant sod. A strong emphasis of the OBWB and WaterWise program is to reduce outdoor water use in the Okanagan. The City of Kelowna will incorporate existing infrastructure such as weather station and flow meter data in municipally controlled outdoor irrigation systems to reduce manual program overrides, reduce water leaks and overall consumption. Residents look to municipalities for leadership in outdoor water use; through this program the City of Kelowna will conserve water in public outdoor spaces, again aligning well with the WaterWise program. This project will create a website to create awareness and broadcast information about the goals to restore sections of Mission Creek through eventual property purchase and dike set-back. Public education and outreach are critical for such a large and long term project. Funding is contingent on contacting Okanagan WaterWise to share networks and make best use of social media tools for outreach. The ecological goods and services assessment will evaluate the ecological value of Mission Creek, in its current state and once restored. 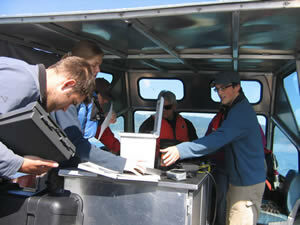 The assessment will include water quality, ecological disturbance resiliency, air quality, and other attributes. The OBWB is very interested in the methodology for completing an ecological goods and services assessment for an ecosystem and will look to this project to provide a template for other areas in the basin. This research will develop a special model to determine the volume inflow rate of a potential contaminant to a Water Distribution system. The results of this project will be shared with water utilities throughout the valley, providing benefit to all. The District of West Kelowna is broadening the scope of the Water Master Plan to account for significant expansion of sanitary sewers, address stronger water conservation measures and adaptation to climate change. OBWB awarded the District of West Kelowna funding toward the initial phase of this planning; the current award will help support the expansion of the plan in newly-sewered areas. This project will provide water conservation information and strategies for the business community. The Westbank and District Chamber of Commerce will involve as many Okanagan Chamber of Commerce branches as possible. Staff welcomes the opportunity to partner with valley wide Chamber of Commerce branches and engage the business sector in water conservation. Coordination with WaterWise will take place over the course of this project. This project will characterize and map landslide areas in the Vernon Creek watershed with linkages to upslope land use. From this landslide and drainage restoration plans will be prepared. Landslide activity was identified as a very high risk to water quality and infrastructure through the 2010 Source Assessment of Vernon Creek. Often source water protection initiatives struggle to completion, but can have a big impact on water quality. Source protection is a priority for the OBWB. District of Peachland will use the WEAP model to manage water supplies, provide visual model results and water management options to the District council and public. This project complements recent OBWB work well; the use of the WEAP model and Water Supply and Demand data are intended to improve water management by Okanagan local governments. Manganese is a common groundwater quality issue for in the Okanagan. The Town of Osoyoos will pilot test an innovative biological removal technology and assess performance, operating costs and design criteria to implement it permanently if successful. All project results will be shared among groundwater users in the valley. This project has basin wide significance, as all groundwater users can benefit from the results. Climate change is increasing the frequency of low flows in Okanagan River; this project will assess the feasibility of changing water intake levels on the Oxbow Lakes of Okanagan River for operation at a lower flow. Ultimately conserving water through Okanagan River (lower flows) will improve Osoyoos Lake habitat for sockeye salmon. This project addresses adaptation to climate change and protects salmon habitat, which are high priorities. Recent funding announcements mean that construction work on the Okanagan River Restoration Initiative (ORRI) will re-commence in 2012, including connecting a side channel to the main river channel. ONA will monitor water quality in the river during the course of this work, ensuring all water quality objectives are met. This project has valley wide benefit. The ONA can use funds remaining from previous water quality monitoring grant to assist with this phase. The City of Penticton will complete a Source Assessment of Penticton Creek in the same manner as many other water utilities throughout the valley. Risks to water supply/quality throughout the watershed will be assessed. Source Assessments are important planning tools for source protection and contribute to valley wide efforts. The overall goal of the Water Ambassador Program is to reduce outdoor water consumption in Naramata, West Bench and Sage Mesa areas of the RDOS through outreach and education. Funding is contingent on continuing to broaden the geographic scope of the Water Ambassador beyond Naramata while building on previous years successes. The FSOG will implement a large scale water conservation pilot project on the Okanagan’s largest ornamental gardens to reduce water use in landscaping, enhance habitat and engage the public in water stewardship. This project uses a variety of ways to reduce water use in a traditional garden setting (high water needs). This project shows strong collaboration with a number of water experts and community support.